Why chose the eKaiser e cigarette with apple and strawberry flavour? The eKaiser Rechargeable Eshisha/Ecigarette is a perfect entry point to the world of vaping. The Kit comes with a rechargeable battery 180mAh for longer use then most e-cigarette batteries of the same style. 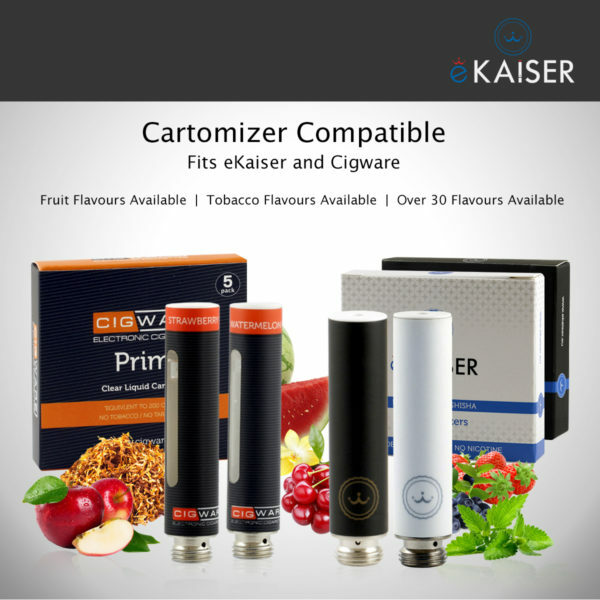 Easy to use USB Charger and 2 new and improved cartomizer flavours. The battery is available in a white and black on Amazon and many eKaiser cartomizer flavours also available on Amazon. Full Warranty and customer support is provided with the product. e cigarette with apple and strawberry flavour is a premium flavour from Ekaiser. 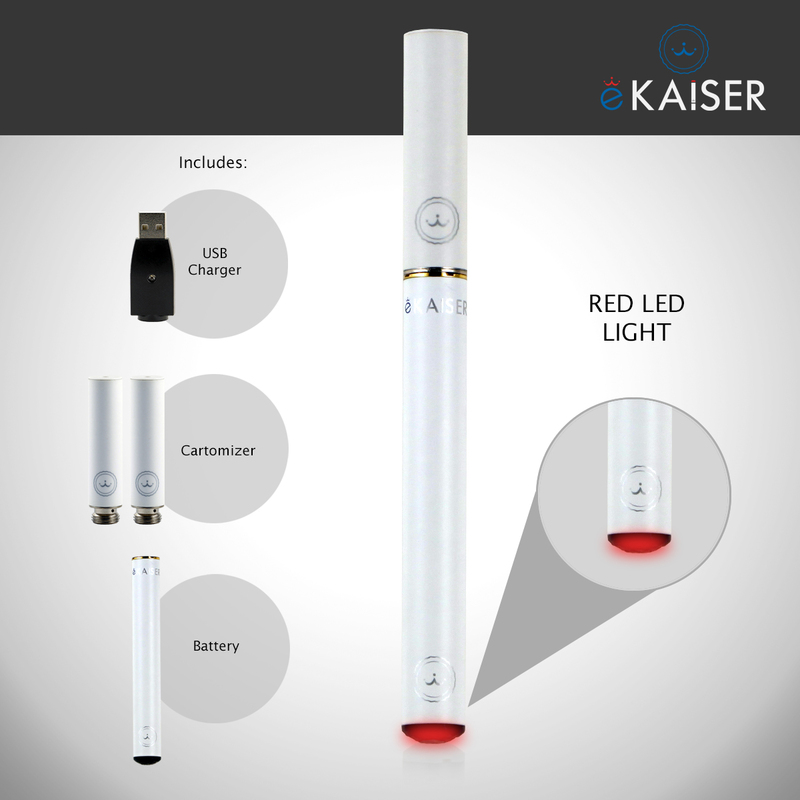 When the user inhales on the eKaiser E Cigarette the tip shows a realistic ash glow. The vapour is produced which on the exhale evaporates within seconds. 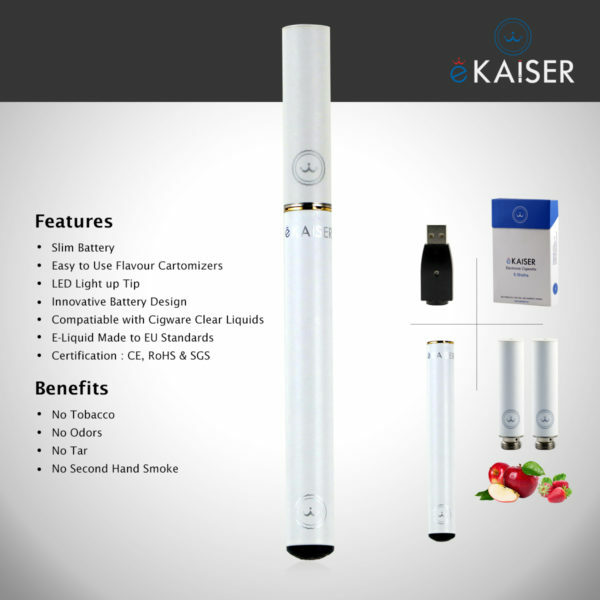 No ash, no lingering smells or odours, just all the pleasures of smoking with no problems. 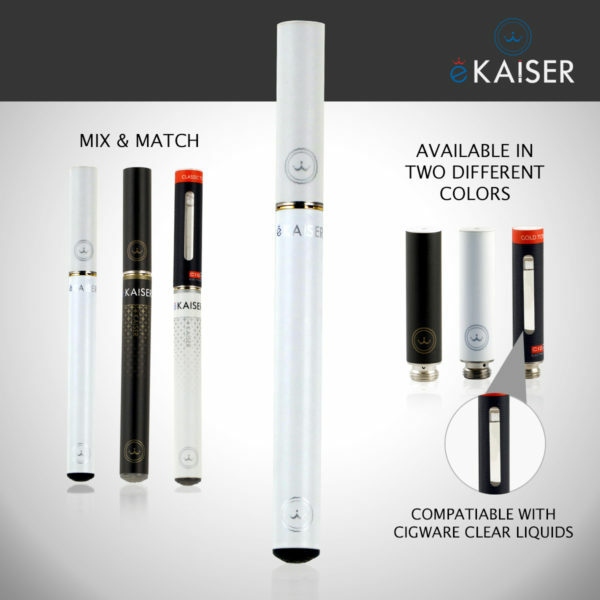 All e-liquid blends contain VG, PG, or mixture of the two. Propylene glycol gives more of the throat hit while Vegetable glycerine gives more of the vapour clouds. 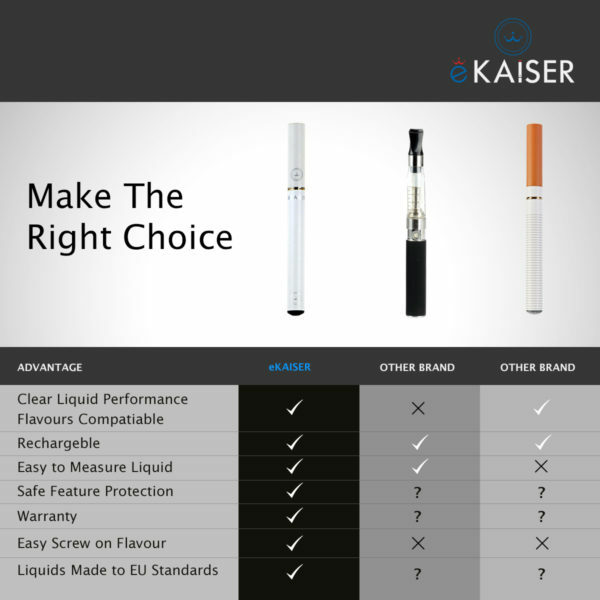 For eKaiser, it was determined through extensive research that the 70/30 (PG/VG) mix was ideal, and was able to deliver the most satisfying experience for smokers. Vegetable glycerine is a heavy, and sweet liquid. Propylene glycol, is thin, but sweeter than VG. 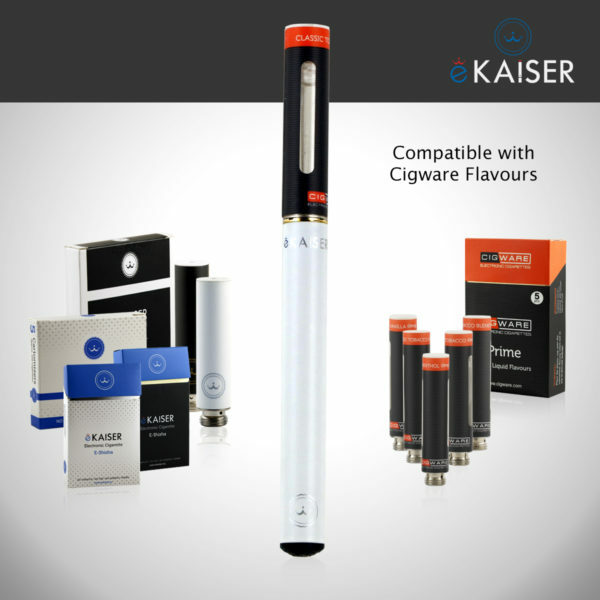 The e cigarette community is very divided when it comes to e-liquid preference. Some enjoy the throat hit of vaping Propylene glycol while others prefer the think clouds of vapour of Vegetable glycerine. 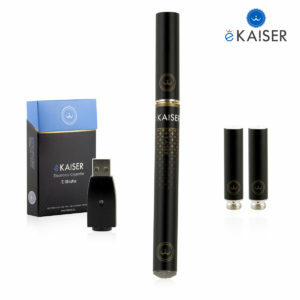 The 30/70 mix from eKaiser contains the ideal measure of both types of e-liquid, allowing you to experience the best of each. This optimal ratio combines the great throat hit with tons of vapour production. I am a social smoker and only smoke very light cigarettes when I’m having a drink. I tried this out for the first time last Saturday as I knew I would be out with smokers and it meant I was able to stay away from the real thing all night. I have only tried the strawberry at the moment but it was a lovely pleasant flavour and no horrible cigarette breath! 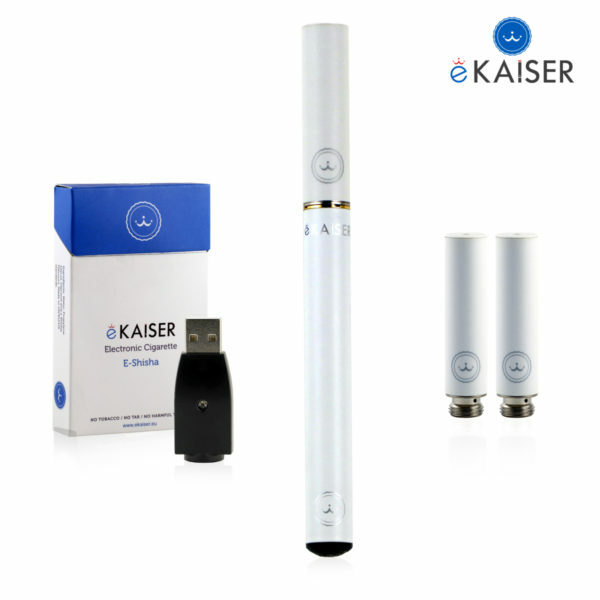 On opening the package I found that the ecig is not like all the others that you buy, but a very elegant colour and shape and much easier to hold. At first I found it a slight bit sweet (I am a savoury person, not a sweet person) but after a few puffs it left a very warm taste in my mouth. It is certainly helping me to overcome my addiction to cigarettes and is now an enjoyable pastime. I would highly recommend this product, not expensive and does the job. Nice and compact, elegant. Can be discretely kept in your handbag. Battery life is good.